Doing my first full Ironman event I had no doubt in my mind that I would be successful running the race, however I didn’t know in what fashion or position I would finish. My expectations were not hi because it was my first Ironman. But my nutrition plan worked well and overall it was a very enjoyable event, in some delusional way if you can call doing an Ironman enjoyable! The race organizers had their hands full because of the weather situations that rolled through on Saturday. We were in danger of losing the swim portion of the race because of riptides and rough water conditions in Lake Erie. But they were able to secure a new swing venue on the other side of Cedar Point in the marina harbor, but that’s where things got really interesting. For the full Ironman distance swimmers we swim through the marina but then around the outside of the barrier wall into open Lake Erie! Needless to say this provided for a very interesting swim on the outside of the breaking the wall and every athlete had the same comment “that was the most insane swim I have ever done! !” It was so crazy that for the half distance athletes they change the swim and had them swim inside of the bay/marina area. Lucky them! But it makes for one heckuva story just surviving the swim. I felt really good during the swim and had a decent time of 1h 20minutes for the 2.4 mile swim Oh, and I didn’t mention that the outside air temperature at 7 AM was approximately 55°, water temperature was warmer than the air! So exiting the water we now had to run 1/2 mile across to Transition 1 where our bicycles were at. They have volunteer for your wetsuit to be pulled off but it was so cold that I choose to wear mine for the run over just to stay warm. I also did it barefoot where other people chose to bring shoes to make the half mile run over pavement that was not carpeted like most of the transitions are. Hard-core!!! Going out for the 112 mile bicycle ride I was positive about that part of the race because I just wanted to make it through the swim which is normally my weaker point and the bicycle is normally my stronger point, out of the three disciplines. I never viewed any of the sections in their entirety, like oh great now I have to ride 100 miles. I always look at each discipline and how far I had come, not how much I had left to go. Because one of the most important aspects in racing is, mental endurance and fortitude, not physical performance. The body can handle way more than we give it credit for. Most the time it’s our brains that get in the way. And I had my Timex One GPS+ watch to keep me on par. The same wind that was making the swim difficult was also an issue on the bike ride. So you had to be cognizant of which direction it was coming from. And by studying the map arrive I knew my best opportunity to make up time was in the beginning when we were mainly headed east with a tail wind. Which worked as I was able to pass people who were holding back on that section because of the long duration of the ride. So if they wanted to catch me it was going to have to be on the run which I was OK with. My bicycle ride was fairly uneventful and my HED wheels with World Wide ceramic bearings and Polydyn lube really helped cut through the wind and the bike was very fast. Which I have to take every advantage I can’t because sometimes I’m not the strongest bicyclist out there. I was able to average over 19mph and finished the ride in 5h 50minutes. And you do have to stop / slow some for potty breaks and water. So now it was on to the marathon. Which I started off quite well considering it’s the longest distance I have ever gone back to back. 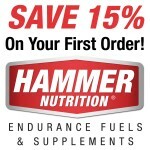 My Hammer nutrition worked flawlessly and I never had any GI issues or felt totally worn down. And that is saying a lot because of the stress you are putting on your body. I even went for a group ride the following Wednesday because I felt fine. Using my Globus EMS, Zola coconut water and Hammer recovery products helped a bunch! And using my DNAFit info is very helpful too for all aspects of training and recovery. So the first 10 miles went rather well but after that is when I started to really struggle. And that is when ankles, toes and my right knee all started to ache more and more. So I broke things down into smaller goals instead of trying to look at the remaining 13 miles I had left, I would run to the next aid station as quickly as I could which was about a mile apart in some sections. And when there were no aid stations I would pick reference points and once I got to those reference point my reward was to walk a short distance and then resume the run. The only real issue I had during the run was at the turnaround for the halfway point when one of the volunteers told me to go straight when I needed to complete my second lap. So after asking a couple of by standards 25 yards down the shoot to the finish they informed me that I had missed the turn around so that gave me a little bit of extra motivation to run faster to make up that time. I have volunteered before and I know it is a thankless job most of the time, but if you volunteer treat it seriously and do it to the best of your ability, because others are still relying on you. So I ran my first Marathon ever during this race and finished with a time of 4h 40minutes. After a swim and 112 mile bike ride I’m good with that time. Overall the event was quite enjoyable and I had a good time experiencing what it is like to do a full Ironman. I finished 6th in my age group and 29th overall. So until the next time I will take away from this experience as many lessons learned and what it takes to really be an Ironman. Thanks to all of my sponsors! Their products and support are invaluable!!! Please give them a look. RIM Racing’s Mike Morgan is sponsored by World Wide Bearings, DNAFit, Polydyn, Timex, Hammer Nutrition, Zola acai drinks, McCabe’s Granola, Bont Shoes, HED Wheels, SRP Graphics. NE Designs provides webpage support and layout.